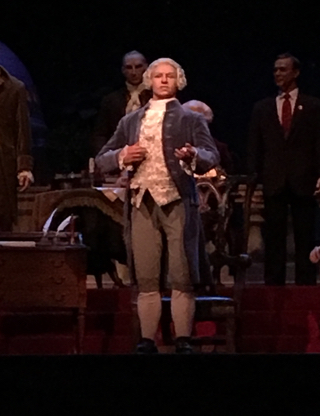 Since The Hall of Presidents will be changing after January, I plan on visiting several more times to enjoy the current show. Although I am looking forward to the new version, you never know how much will be changed. My hope is that the Lincoln and Washington animatronics will continue to have "speaking" rolls, along with the new President Trump. I took this shot of George Washington a few days ago. Rock 'n' Roller Coaster is one the most popular roller coasters in the country. It goes from 0-60 in under 3 seconds with g-forces similar to a space shuttle launch. 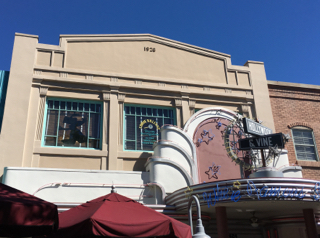 Although it is known for its "thrill" factor, it is also home to some fun hidden Mickey's, found in this picture on the exterior of the building. 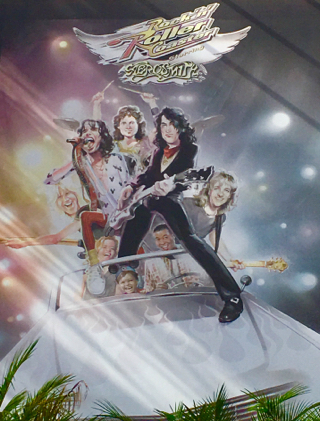 If you look closely, you will see Mickey's on the singer's shirt, the guitar player's necklace, as well as on the head of the little boy in the car. 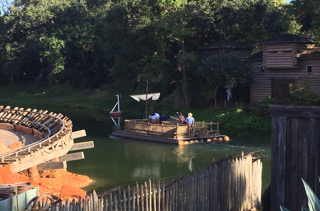 The Huck Finn is one of the rafts that brings guests from the mainland to Tom Sawyer Island. This morning, I noticed it in an unexpected location, passing by Big Thunder Mountain Railroad. It must have been headed backstage to a maintenance area. 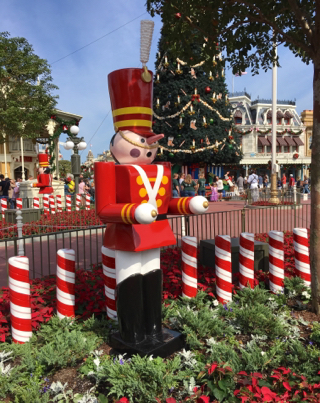 The holidays are in full swing, and much of the Walt Disney World resort is decorated for Christmas. While enjoying the Living with the Land attraction at Epcot today, I noticed this "sandman." There is no snow in Central Florida, so this is the next best thing. One of the fun things about visiting Animal Kingdom, is that you can learn something each time you are there. A few days ago, I learned about the pacu, which is a large, omnivorous relative of the pirhana. 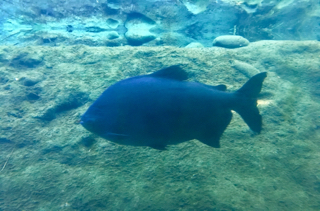 This fish can be found in the otter area on Discovery Island, across from Pizzafari. 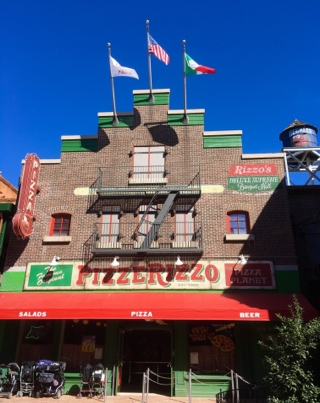 Pizzerizzo opened about a week ago in Hollywood Studios. Disney completely reimagined the old Pizza Planet into this new restaurant. It is themed to the Muppet's Rizzo the Rat, and has some great Muppets' gags throughout. If you look in the shadow to the right of the word Pizzerizzo, you will see a tribute to Pizza Planet. Disney Springs just debuted an amazing new nighttime Christmas show called Starbright Holidays. 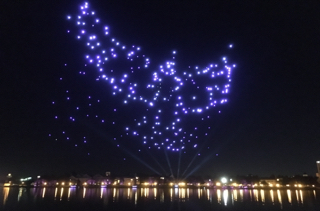 It utilizes 300 individual flying drones, that each have high intensity lights on them. The show is computer controlled and is a collaboration with Intel. The lights form several huge shapes in the sky, and this angel was part of the finale from last night. Hundreds of birds can be found throughout Animal Kingdom. 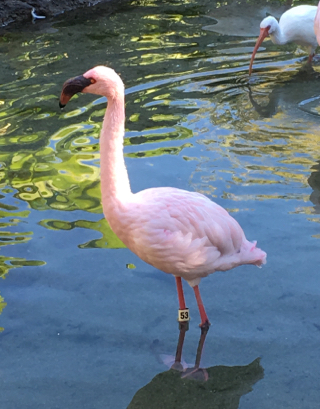 The flamingos are certainly one the more interesting types that guests can see. I took this shot while giving a tour today. You can see a white ibis in the background, which is a common bird, native to Florida. 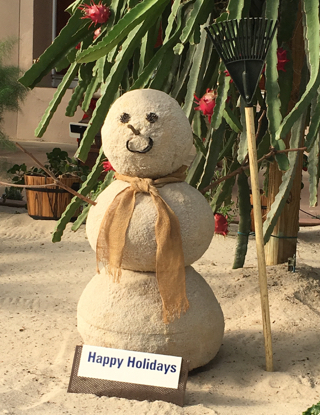 The Christmas season is in full swing, and the decorations are up at all four parks, as well as the resorts. In addition to the decor, there are several new shows this year that recently debuted. 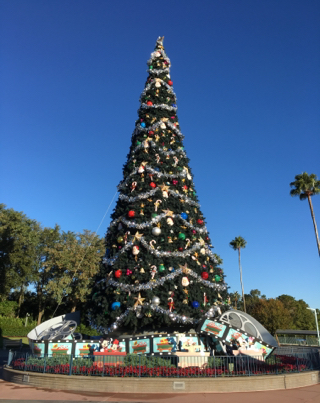 I took this shot of the Christmas tree outside of Hollywood Studios this morning. 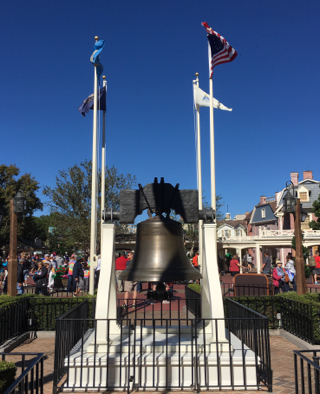 Yesterday's post was about the Liberty Belle riverboat. Today, I took a shot of the Liberty Bell itself. It is the only "other" one cast from the original mold. They even spelled Pensylvania wrong on this one. 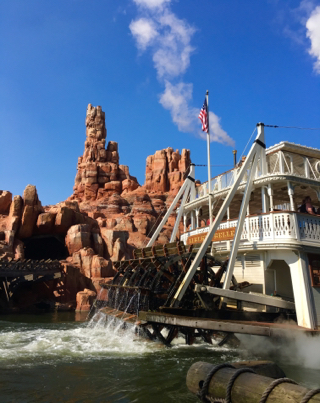 The Liberty Belle riverboat circles Tom Sawyer Island, and allows guests to enjoy unique views of Liberty Square and Frontierland. Yesterday, I was on the island when I snapped this shot. I liked using Big Thunder Mountain as a backdrop for the paddle wheel on the riverboat. 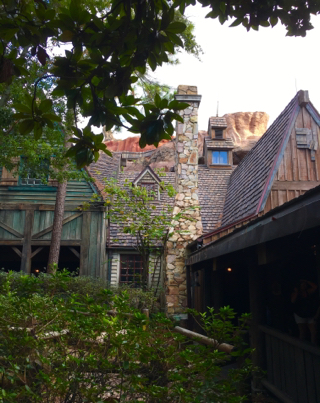 Tom Sawyer Island is one the most overlooked areas of Magic Kingdom, when it comes to details. 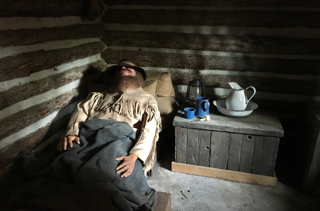 Fort Langhorn has several interesting animatronics, including horses, chickens, and this sleeping man in the "guard house." You can actually see his chest moving up and down as he sleeps. 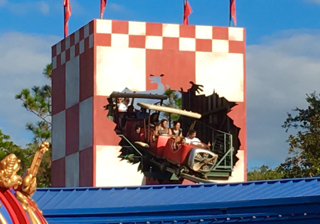 The Barnstormer is a fun little coaster that can be enjoyed by most Magic Kingdom guests. The height requirement is only 35" so only the youngest kids don't make the cut. I was standing near the exit of Dumbo when I took this shot of the coaster "flying" by. Animal Kingdom Lodge is so much more than just a hotel. It has amazing pools, top notch restaurants, and it's own African savanna. I like to visit this resort as often as possible. 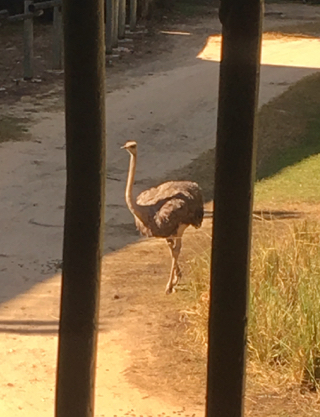 Today, I spent some time in the Sunset Lounge, where I took this shot of an osterich through a fence overlooking the savanna. 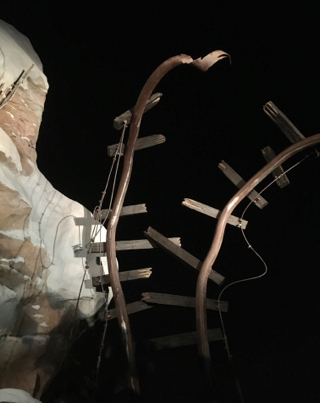 Splash Mountain is one of the most detailed attractions in all of Walt Disney World. This eleven minute ride has five drops and some amazing animatronics. However, the exterior is also quite impressive. I took this shot near the exit last week. Even when Disney is in the process refurbishing an attraction, they still keep the "story" alive. 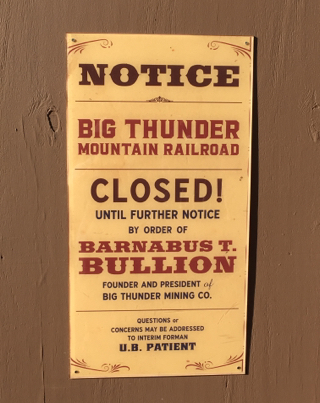 Big Thunder Mountain Railroad has been closed for months, and will reopen again soon. However, these signs on the construction walls have been entertaining. I particularly like the name of the "interim forman" listed at the bottom of this sign. 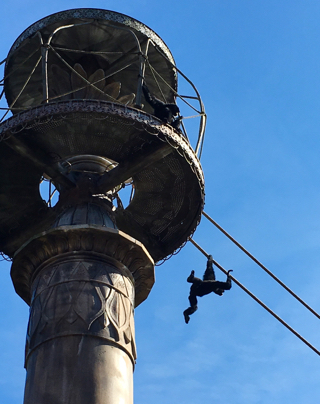 The Siamang Gibbons are some of the most fun animals to observe at Animal Kingdom. Located in Asia, these fearless 4-year old twin sisters hang out 40-50 above the ground. I took this shot yesterday, while giving a tour. One of the fun things about Tomorrowland Speedway is the bleachers where people can sit and observe the "race." I often wait for my tour guests up there. 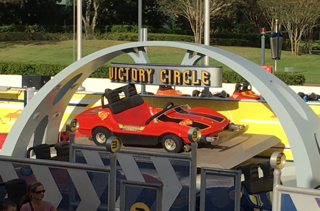 I took this shot of Victory Circle from that area a few days ago. 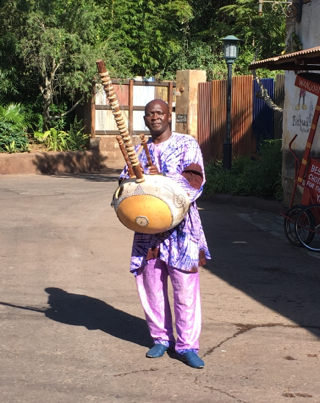 While walking thru the Africa section of Animal Kingdom today, I heard some unique and beautiful music. At first, I thought it was simply recorded background music. However, I soon came upon this man playing the Kora, which is a 21 string African instrument. The performance was being wirelessly transmitted to speakers in the Harambe Market area. 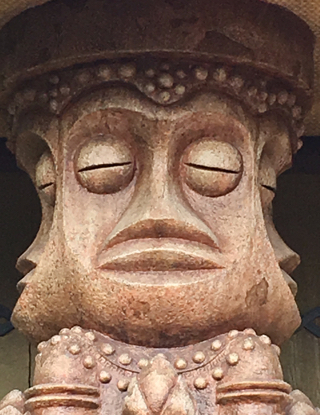 This Tiki God is on the exterior of Walt Disney's Enchanted Tiki Room in Adventureland. It is looking directly at the Magic Carpets of Aladdin. If you look closely at his forehead, you can see a hidden Mickey made of stones. Chip and Dale meet guests at Magic Kingdom in Frontierland, not far from Liberty Square. They are dressed in cowboy outfits, to represent the American west in the 1800s. 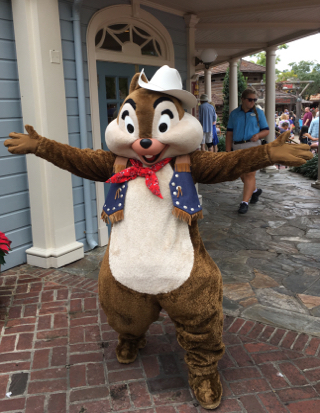 I was standing near the Diamond Horseshoe today, when Chip posed for this shot. On this historic day, this seems to be the right photo to post. I took it while giving a tour at Magic Kingdom yesterday. 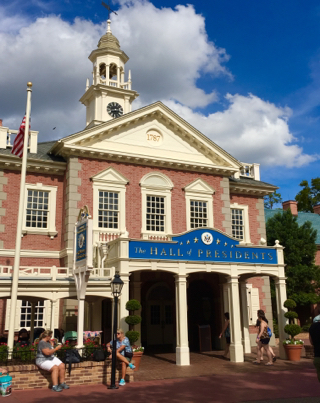 It is going to be fun to see the newest President added to the attraction early next year. While touring at Hollywood Studios last week, I noticed a fun photo opportunity developing. As I saw this stormtrooper walking toward me, I found the backdrop to be interesting. 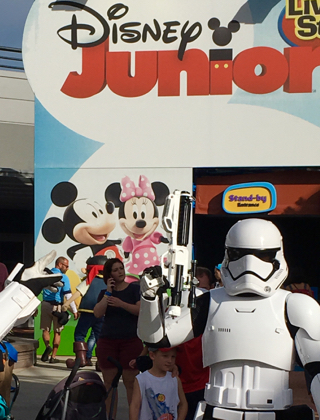 You have this ominous "soldier" from the Galactic Empire in the same shot as a smiling Mickey and Minnie. Although very different, we have to remember that they are all Disney characters. Disney Springs is nearly 100% complete and fun little details are popping up all around this reimagined shopping district. 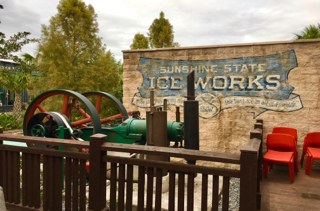 Today, we were enjoying cupcakes from the Sprinkles Bakery, when I noticed this seemingly old steam engine at the end of the outdoor seating area. According to the nearby sign, it is an ice maker. 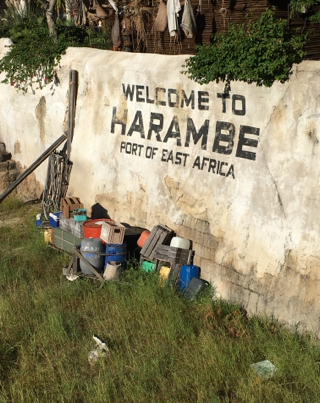 Harambe is the African village in Animal Kingdom. It is full of incredible details that help transport guests to another continent. This spot is by the river in the area of the Festival of the Lion King show. I took this shot while giving an Animal Kingdom tour today. This is one of my favorite times of year at Walt Disney World. Just a few days ago, the Magic Kingdom was completely decorated for Halloween. Where this toy soldier is currently standing, there was a scarecrow for most of September and October. Now, it has been totally transformed into Christmas. In addition to the decorations, Main Street is filled with holiday music. While waiting for my tour guests to arrive at Hollywood Studios this morning, I noticed this interesting view near one of the bus stop areas. 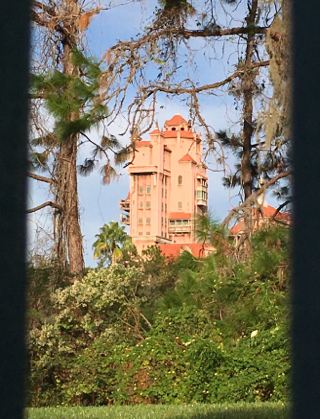 At first, I liked the way the trees framed Tower of Terror. I then decided to get low and take the shot through a wrought iron fence, to get some additional framing. 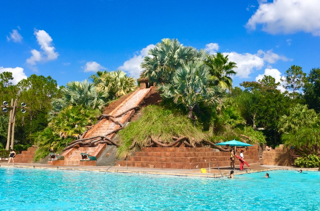 One of the best pools at Walt Disney World can be found at the Coronado Springs resort. It is across the lake from the main lobby building, and hidden behind some trees. However, when you walk into the "Dig Site" area, the pyramid structure that comes into view is very impressive.